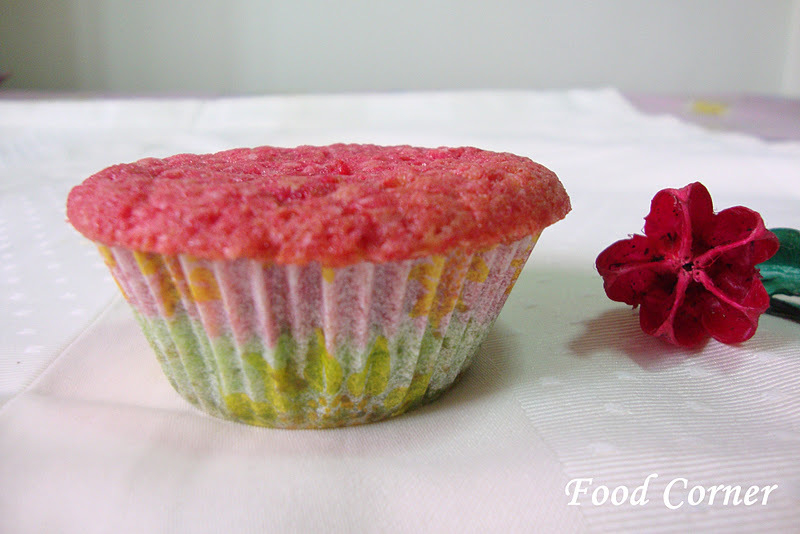 I was inspired by seen Rainbow Cupcakes in many blogs & websites & thought of trying them. However I used only two colours & selected colours as Red & Green. Red & Green perfectly match with this Christmas season. Preheat oven for 350F.Line the baking pan with cupcake liners. In a bowl combine flour & baking powder, keep aside. 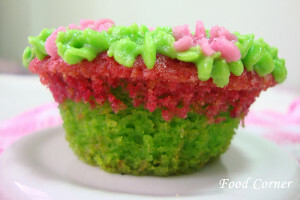 First fill the ½ of cupcake liners with Green coloured batter. 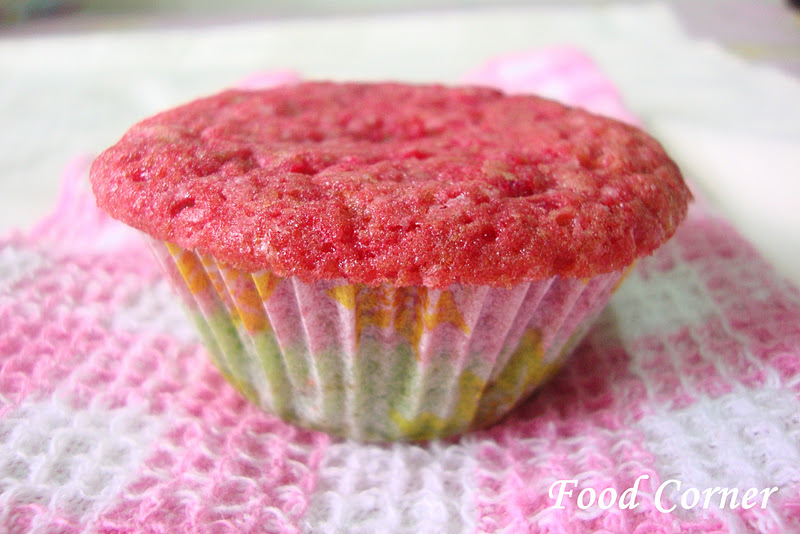 After that use Red coloured batter & fill upto ¾ of the cup. Bake for about 20 to 25 mins or until baked well. 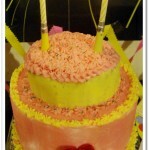 I used buttercream icing for decorating. Used star tip & decorate it with a simple design. 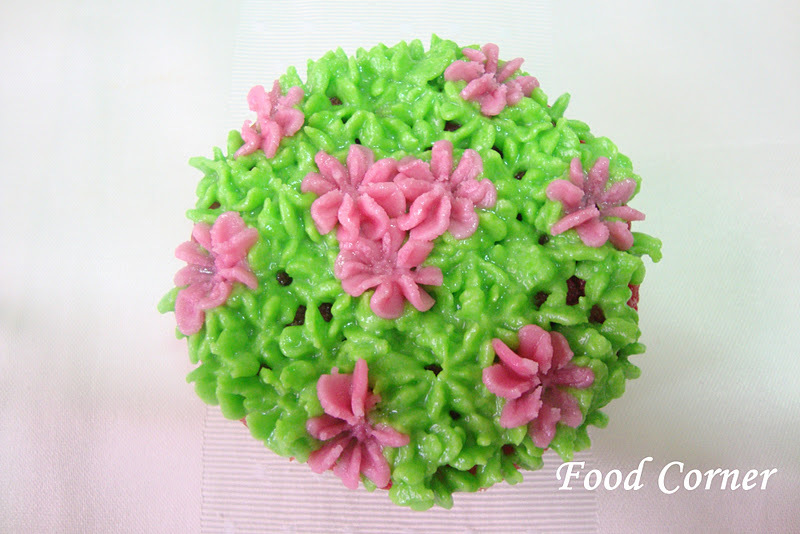 Delicious cupcakes, great icing. I wish I had your courage to ice. Looks so delicious. So beautiful! Thank you so much for sharing at Taking A Timeout Thursday and welcome! Hi, Amy. I saw your rainbow cupcakes over at Miz Helen’s. They are so pretty!! My mom would make up cupcakes and they would be all different colors. There was a surprise in every bite! We loved it. I just love your Rainbow Cupcakes, they look so pretty and delicious. We would really enjoy them. 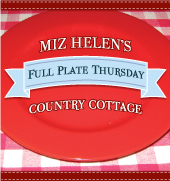 Thank you so much for sharing with Full Plate Thursday. We are wishing you and your family a very Merry Christmas! cup cake looks so colourful and delicious.. great job! Oh my goodness, these are DARLING!!! Thanks for sharing them at Overflowing with Creativity!!! Merry Christmas to you and yours!!! pretty cupcakes and they are so yummy..
Beautiful cupcakes, Amy. 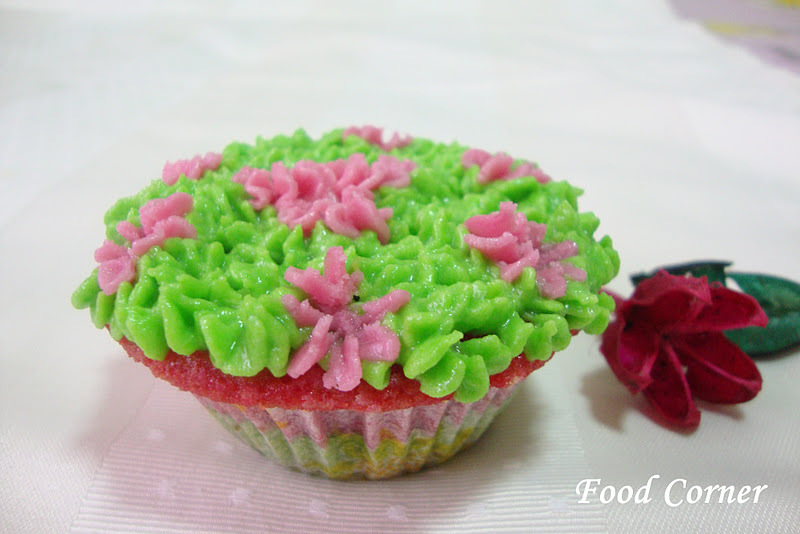 Love the colours and the frosting pattern on top. Merry Christmas to you and your family, Amy. These are beautiful! I know someone who will love these!! 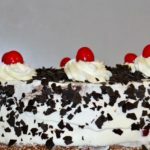 Thanks for linking to Foodie Friday! Please take a moment and check out…..
Wow! These are so beautiful and I am sure oh so delicious Amy. Thanks for sharing them on the Creative Blog Hop and becoming a Follower of my Blog. 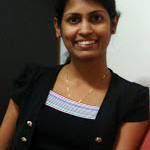 I am happy to also join your wonderful Blog. Have a great holiday season. So cute, my son loves when I make these. I love that they think it is the most amazing thing ever. Makes us moms look good. 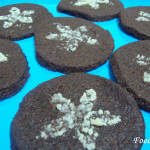 These look yummy, thank you for linking this up with Show Your Stuff. These cupcakes look so festive. Thanks for sharing them at Time Travel Thursday. Colorful cupcakes. Thx for linking to the event and happy 2012. These look so cute. 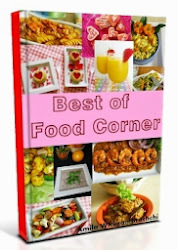 Thanks for linking to simply.food let’s cook for Xmas red/ green event. Thanks for linking this to My Meatless Mondays. 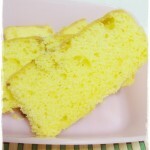 We will be featuring the recipe tomorrow evening. Come and visit. Full of color and flavor! 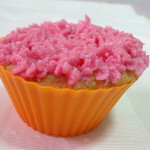 Thanks so much for linking them up at Muffin Monday!